Microdynamics: Particularly with classical music, the TD550/Ortofon/EMT combo drew me in with its tremendous presentation of microdynamics. As with a live performance, dynamic nuance was super present - hyper detailed and hyper sensitive. The opening tympani notes (side 3) for example of Mahler's Symphony #7 [Rafael Kubelik, Orchester Des Bayerischen Rundfunks, Deutsche Grammophon] were extremely tactile, resonant and warm. It simply made you stop and listen. Critical listeners in my small warren were quickly stilled by the Mahler disc's dynamics via the Thorens / Ortofon / EMT combo. The music simply captured your soul, every subtle change in dynamics topped with blood, guts and intellect demanding an equal emotional response. It's hard to quantify the speed, tonality and effortlessness that accompanied the playback experience with a table of this caliber. Music jumps, stops, starts and flows with utter freedom and faith to the recorded event. Bass response: The TD550 is a suspended design table. In the past, suspended tables could mean boomy bass and aggravating footfalls. Perhaps that designation was not as pertinent to higher-end tables but such was the conventional wisdom at least in my home. The TD550 accurately tracked the bass notes of every LP put to its massive platter. As with any great piece of hifi kit, the TD550 never highlighted one portion of the audio spectrum over another, thus, the bass was never in my face nor lacking in any degree of musicality. It was simply accurate to the recorded event. Naturalness reigned supreme. Even when I thought the 550 was perhaps tracking acoustic bass with an overly warm and gentle demeanor, it surprised me by carving out super-defined notes on, of all things, a Columbia 3-Eye '60s recording of Tony Bennett with the Ralph Sharon trio and an even more ancient 1950s Jo Jones Trio LP on Everest [Fresh Sounds reissue]. Faithful to the event! Naturalness: The TD550 exposed every recording for its true sonic signature. Hank Mobley's Soul Station on Blue Note bopped my apartment silly. The Beatles' Sgt Peppers Lonely Hearts Club Band on German Odeon (blue?) label "A Day in the Life" never sounded so eerie, Abbey Road studio spacious and intimate. The new Legacy reissue of Boston's debut LP? As bad as it ever was though supercharged. The TD550 didn't editorialize, it simply exposed. Wonderful recordings came into their own, the Thorens getting out of the way and releasing the notes with humble service to the sound. 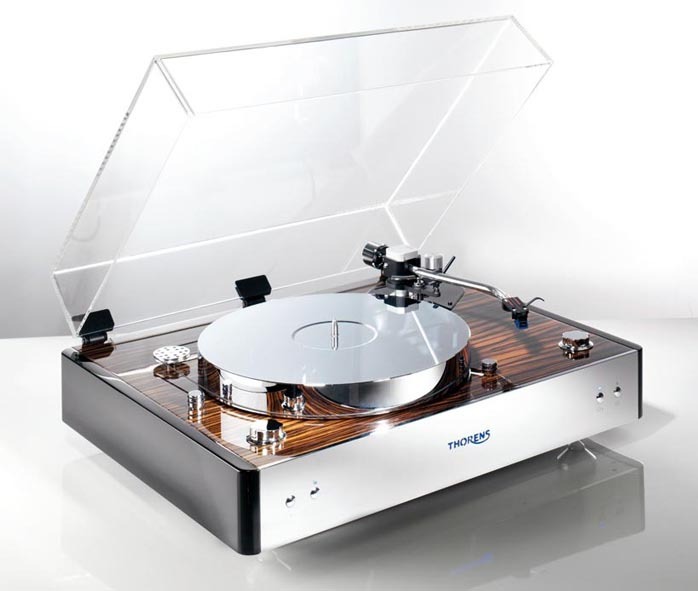 There was never one consistent sound to the Thorens. It simply bought the music to life to quote an advertising campaign. Flow: When music flows, everything else works together to please the senses. The TD 550 is easily recommended, highly regarded and just about perfect. It bowled me over. But in weighing all the components of the setup procedure, the manuals and price involved, all is not as it seems. 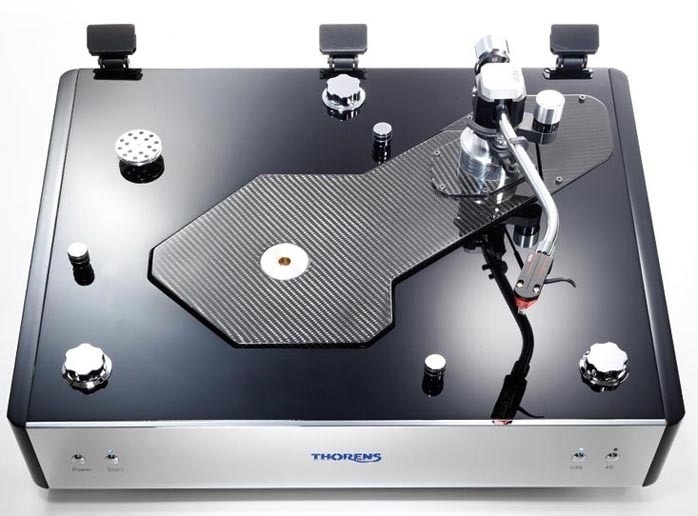 First, let's delve into the Thorens/Ortofon/EMT rig, piece by piece, with a word of description from the manufacturers or company representatives. EMT (originally Electrical Measuring Technology or Elektromesstechnik) manufactures the TSD15 as their ultimate broadcast and studio mastering cart, with the JSD model ($3,295) above it as their flagship two-channel 'audiophile' cartridge. Particular perks for the prospective EMT consumer? Besides a healthy line that includes several different models including mono and 78RPM-specific cartridges, EMT is the only company that completely rebuilds the cart when sent in for retipping. Beyond simply glueing on a new cantilever, EMT recharges the magnet, winds a new coil, installs a new cantilever and new tip - in short, you receive a functionally new cart for 20% off retail. Some have described the EMT TSD15 as having mucho jump, extreme dynamics and a lively, rich, warm and textured sound, i.e. anything but dry or crisp. Before dissecting the cart's qualities using it with my Kuzma table (read below), that description matches my experience with the Thorens. Recommended tracking force for the TSD15 is between 2.2 and 2.5 grams, output is 1mv. The EMT supplied for review by distributor Tone Imports was stripped of its body to allow swapping among various tone arms.